Police in Brazil have seized 60 assault rifles that had been smuggled from the US city of Miami in a shipment of swimming pool heaters. The weapons, which included 45 AK-47 guns, were found at the cargo terminal at Rio de Janeiro's Galeao International Airport. Four people have been arrested, police said. It is one of the largest seizures of such weapons in Brazilian history, local media reported. Authorities put the rifles on show, and released an X-ray image that showed the wrapped guns concealed inside the containers of pool heating systems. 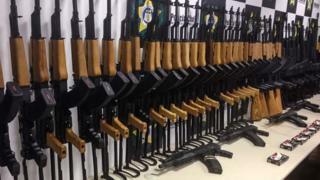 It is believed the guns could have been sold in Brazil for up to $1.5m (£1.1m) in total. Detectives are investigating an exporter in Miami, Globo newspaper reported without identifying them. Security forces in Brazil are struggling to stop powerful automatic weapons falling into the hands of drugs gangs and militia groups which control poorer areas of major cities.